Come the colder months I find it impossible to resist the warmer, deeper scents in my stash. I love the more fruity, floral and almost holiday-in-a-bottle scents of spring and summer, but they just don't quite cut it in winter. Melvita L'Or Bio Eau de Toilette* £28.80 is a new scent to join my stash, the perfect in-between scent which has a touch of the sweet scents we all love in summer, with more depth and warmth making it a perfect scent for the colder months too. Inspired by the 5 unique wonders of the world, it combines notes of Italian Bergamot, White Jasmine, Fig Leaf, Tiare Flower and Virginian Cedar to create a scent that is utterly addictive. Created using organic ingredients, it's a lovely natural and cruelty free scent. YSL Black Opium £37.40 - £65.85 is one of those scents which will be popping on most people's wishlists this Christmas, a scent which is beautifully presented in a stunning bottle. A warmer, deeper scent, it features top notes of Coffee and Pink Pepper, with heart notes of Orange Blossom, Jasmine and Vanilla, alongside base notes of Patchouli and Cedar. My new scent obsession, this is one fragrance anyone would find hard to resist. The Body Shop White Musk Smoky Rose Eau de Parfum £11 - £14 is a scent I picked up in a gift-set last Christmas, and one of my favourite everyday scents to reach for in winter. With Black Smoky Rose and Tobacco Flower, alongside an delicious blend of cruelty-free Musk, it has a more feminine touch to the usual White Musk line. A perfect scent for any occasion, I've been reaching for White Musk Smoky Rose again since October, a scent I can't get enough of. What's your go-to winter scent? 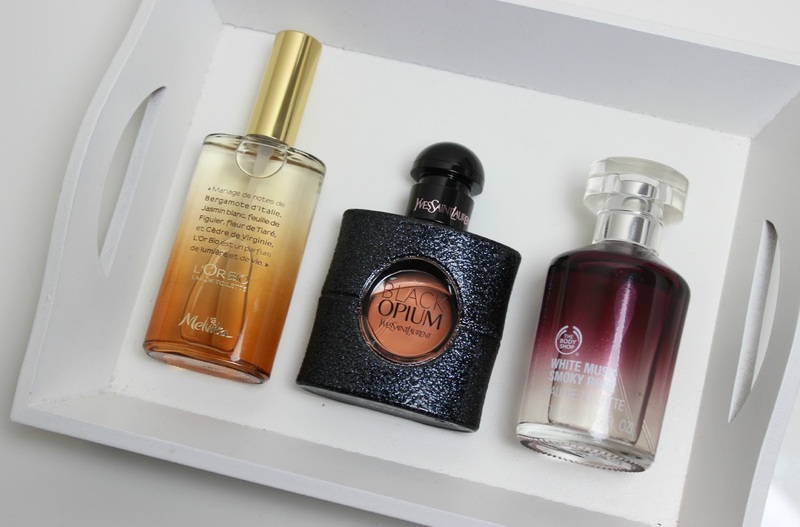 I adore Black Opium it's going in my 2014 favourites!